Note: The dust has yet to settle, and the front lines remain fluid, information may be inaccurate or change soon after the publication of this article, I’ll try to keep it as up to date as possible. As the fighting draws into its sixth day, the ongoing battle on the stretch between Rebel-captured Debaltseve and Ukrainian Government-controlled Svitlodarsk is yet without any clear winner, with no significant amount of ground gained for either side. Considered to be one of the bloodiest battles of the year, the battle which pro-Russians identify as a fight for Debaltseve, and Ukrainians call the “Svitlodarsk bulge” has been perceived as a defensive operation from both opposing parties since heavy fighting commenced. The battle takes place near the same area as the battle for Debaltseve in early winter 2015 when it was in its terminal stages, and Ukrainian forces managed to make a break-out from the besieged city before being overwhelmed by Russian and rebel forces in what is held to be the greatest military loss to Ukraine since the initial Russian thrust into Donbass in August 2014, rivaled only by the battle for Donetsk International Airport. Over the course of the past couple of days, Ukrainian forces primarily from the 1st Battalion and the 25th Mechanized Battalion “Kievskaya Rus” of the 54th Independent Mechanized Brigade have at least at one point managed to secure and entrench in key positions on hill 223,2 and 183,2. The previously contested town of Lozove now also appears to be fully under Ukrainian control. The story from Ukrainian sources is that separatists went on the offensive in the direction of Svitlodarsk, and that Ukrainian Armed Forces (UAF) launched a counter-offense supported by BMPs and 122mm artillery. In the apparent success of this initial counteroffensive, Ukrainian forces overran rebel trenches and dug in. Since then, fighting has been continuing at a high intensity, with UAF pushing their way southwards on the western flank of Logvynove primarily. Rebel sources mention disruptively high intensity of artillery fire, but still claim to be holding out well against UAF offensives. Although the exact situation is uncertain in terms of gains and losses, it is certain that the UAF have been met with staunch resistance and suffered many casualties, having to rotate attacking teams with fresh teams to hold captured positions due the amount of WIA and KIA during the initial counteroffensive. Many of the lost Ukrainian fighters have belonged to Right Sector’s Ukrainian Volunteer Corps. On the opposing side, all three mechanized battalions of the separatist Donetsk People’s Republic (DPR) 7th Independent Mechanized Brigade under Lugansk People’s Republic (LPR) command have been the driving force in thwarting the Ukrainian advance, likely supported by fighters from the DPR 3rd Independent Mechanized Brigade. The 7th Independent Mechanized Brigade originated in DPR (as a rule, brigades with uneven numbers are DPR, even numbers are LPR), but was transferred under LPR command and tasked with the defense of Debaltseve, where it is stationed. The 3rd Independent Mechanized Brigade is stationed in the nearby Horlivka, with which it is tasked to defend. As the battle draws on, rebels too have brought out heavy artillery and made extensive use of it, but still find themselves overwhelmed by Ukrainian Artillery, which by the use of reconnaissance drones has grown increasingly accurate throughout the conflict. According to rebel sources, on the third day of fighting, separatist casualties numbered up to 28 killed and 63 wounded. In light of the agreement of ceasefire scheduled to go into effect on the 24th of December, there is some cautious optimism that fighting might simmer down for the holidays. It is, however, undoubtedly not a ceasefire which any party is happy with, the separatists having lost territory, and the UAF having bad experiences with separatists taking advantage of ceasefires to move strategically imperative equipment into favorable positions. An airborne force with no fixed or rotary wing element may seem counterintuitive, but it is reality in the separatist rebel forces in Donetsk. The Republican Guard, after a great deal of reform has been mostly reorganized into the 100th Separate Mechanized Brigade (100-й ОМСБр), save for some individual units which have stayed under the direct command of the Republican Guard, but still have undergone significant reform. In all fairness, the 100th Mechanized Brigade is neither an airborne brigade in name or in reality, but its appearance oozes VDV (Воздушно-Десантные Войска), the Russian/Soviet airborne troop. The dress uniforms of soldiers in this brigade consists of the sky-blue berets with the “DPR” flag pin/patch on one side and a soaring eagle perched on its top, soldiers also wear blue and white striped undershirts (Telnyashka) and parachute insignia on their collars, all signature traits of the VDV. 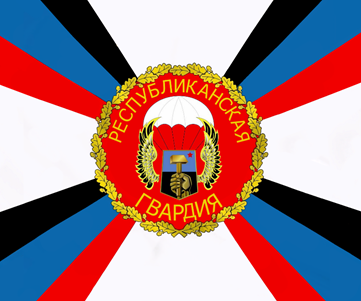 The Color (unit flag) of the Republican Guard (pictured above) is the seal of the city of Donetsk with wings and a parachute, evoking a notion that this would be an airborne unit. But why would a mechanized brigade have the appearance of an airborne force? The answer most likely lies in the process of nation-building rather than any purely military line of reasoning. The VDV holds a special place in the hearts of people in the post-soviet space, and in Russia especially. Most post-soviet countries still have some sort of airborne force, even if only by name as is the case in some Central Asian states. The VDV can be with some accuracy compared to the US Marine Corps in terms of how it is celebrated in popular culture, it is a common enough force to have a large constituency but has a reputation for extraordinary toughness. It should thus be reasonable to assume that this appearance is a question of morale and civic nation-building, if all post-soviet countries have some variation of an airborne force, then surely it would be pertinent to have one in the country you are attempting to build. 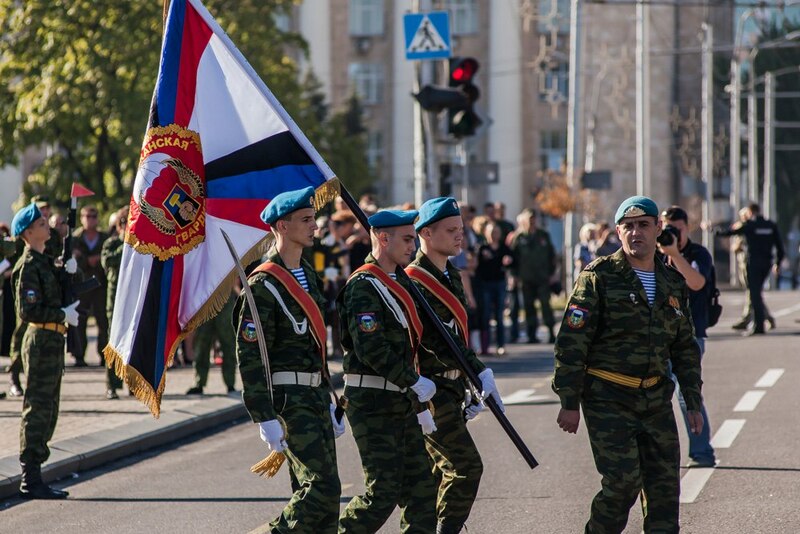 When the 100th Mechanized Brigade celebrated its one-year anniversary recently, much had changed in the Republican guard since its inception, and indeed much has changed in the “DPR Armed Forces” since then too. 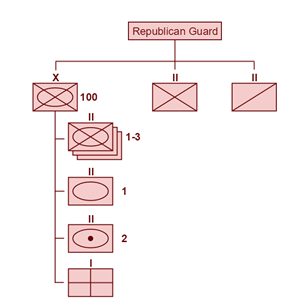 Changes to the Republican Guard have not simply been internal restructuring, but also transferals of units to outside the guard and even some outside the 1st Army Corps. On a very basic level, the Republican Guard used to be split up into nine known ‘Battalion Tactical Groups’ (BTGr) and other, smaller units which were scattered throughout the territory held by “DPR”, now the Republican Guard is split up into three ‘unit numbers’; the 100th Mechanized Brigade, an assault battalion and a ‘Special Forces’ battalion. The concept of the BTGr comes from the Russian military, dating back to the Soviet Union (where it was abbreviated as BTG), in which it had sprung out of necessity in the Soviet-Afghan war, where the lack of defined front lines required a combined arms force at a battalion level. [i] Conversely, in the conflict in Eastern Ukraine, which has defined front lines, the BTGr concept would hypothetically be used as a way to have small combined-arms units capable of operating independently on the entire front of the “DPR”. Most likely, a combination of factors contributed to the decision to change the Republican Guard from being a bunch of BTGrs to focus on a brigade structure. One such factor could be the increased confidence in the solidifying front lines, in which combat support can safely support units in combat, even outside of the battalion level. A second factor could be a lack of materiel and skilled personnel to support combined arms operations on a battalion level, something which is not unthinkable considering the current state of the Republican Guard. In this restructure, the 6th and 7th Battalion Tactical Groups were transferred to the 9th Mechanized Regiment by Novoazovsk, on the southern front of the crisis in Donbass. The 8th BTGr “International Brigade Pyatnashka”, led by “Abkhaz” and containing many fighters from the Caucasus, has been completely removed from the 1st Army Corps entirely, but appears to still somehow exist, although their place defending Marynka has been replaced by remaining fighters from the Republican Guard. The former 5th BTGr has been reorganized into a 3rd Separate Mechanized Battalion, presumably within the 1st Army Corps. The 4th Battalion / BTGr “Cheburashka”, named after the beloved Soviet cartoon character, was also disbanded this spring, and its remaining members sent to the 11th Regiment “Vostok” – stationed up by the Capital of the de-facto republic. What we are left with is a separate mechanized brigade within the Republican Guard which consist of three mechanized battalions, a tank battalion, a self-propelled howitzer battalion and a medical company, it is also possible, but unlikely that a battery of the SA-8 Gecko radar guided air defense missiles that reside within Donetsk are subordinate to the 100th brigade, especially considering that the Republican Guard originated as a “territorial defense” force[ii]. Starting with the mechanized battalions, it is likely that they each consist of two or three mechanized companies with BMP-2s as well as a mortar company with self-propelled (truck mounted) 2B9 Vasilek 82 mm mortars. The tank battalion seems to be sparsely populated, consisting of perhaps the least uniform collection of tanks in the 1st Army Corps, with both T-72s and T-64s sporting a wide variety of ERA generations and configurations. The tank battalion also has a shortage in manpower, a common theme in specialized units where trained crew can be difficult to come by, and the recently established military academy (Дон ВОКУ) evidently being unable to train enough crew to fill these positions at this time. The 2nd self-propelled howitzer battalion consists of at least three batteries of 2s1 Gvozdika 122 mm howitzers, seemingly being somewhat adequately staffed. Most, if not all of the artillery pieces in the 2nd self-propelled howitzer battalion come from the artillery brigade “Kalimus”, lending to the theories that either it was an existing Kalimus battalion that has been transferred to the 100th brigade, that only the artillery pieces have been transferred, or that it is simply a “Kalimus” battalion attached to the 100th brigade. There is also a medical company in the 100th Brigade and presumably also a staff company and other combat support units, but these are the ones identified at this point. Remaining within the Republican Guard are two other battalions; the Separate Assault Battalion (ОШБ) and the Separate Special Tasks (Spetsnaz) Battalion (ОБСпН) “Patriot”. The Separate Assault Battalion was supposedly created out of the former military intelligence unit/directorate (GRU) of the Republican Guard. This battalion is a sort of infantry battalion, which also performs more asymmetric tasks like crafting and placing Improvised Explosive Devices (IED), while still performing tasks such as front line defense and checkpoint duty. The Separate Spetsnaz Battalion “Patriot” was once the 9th Battalion of the Republican Guard, and is the special operations force of the Republican Guard. The assault battalion wears parachute insignia much like the 100th brigade, while “Patriot” gives off little indication that it may be in the Republican Guard. It would however be a good idea to take this graphic with a grain of salt, as the commander of “Pyatnashka” attended the “Union of Volunteers of Donbass” conference in Rostov-on-Don wearing old Republican Guard insignia. In addition to this, a news segment in September 2016 mentioned a SpetsNaz regiment containing “Pyatnashka”, Detachment “Chechen” and “Patriot”.This could mean any number of things, that a new regiment has been formed under the RG, reeling in “Chechen” and “Pyatnashka”. It could also that the new regiment has been formed outside of the RG and that Patriot is in fact no longer part of the Republican Guard, which seems somewhat more likely. Not much is known about this regiment, the most certain member is detachment “Chechen”, in which the members have “SpetsNaz regiment” (Полк Специального Назначения) written on their unit patches. All indicators would suggest that this ‘regiment’ is still in its early stages of development, and may not even fall under the MoD, but more likely is an armed unit within the Ministry of Interior. With this in mind, it is still too early to say if the Republican Guard will exclusively consist of the 100th Brigade or not. Armored vehicles in the Republican Guard can ostensibly be identified by the mark “РГ” (RG) in a diamond, and more specifically, the 100th brigade would have “100” in a diamond also (pictured below). In reality however, many Republican Guard vehicles appear to be unmarked, or marked as being from other units, presumably as a result of reshuffling of materiel. The leaderships of the Republican Guard have also undergone some rough times, with the commander of the 100th being switched out earlier than a year after it was created. Initially the 100th Separate Mechanized Brigade (Unit Number 08826) was commanded by an S. Belov, but currently the brigade is under the command of colonel S. Svirskiy. Furthermore, some figures in the Republican Guard leadership has suffered some unfortunate fates. The second in command of the 100th Separate Mechanized Brigade, colonel Evgeniy “Kot” (cat) Kononov was killed[iii] by “Ukrainian snipers” in his office in Donetsk shortly after the formation of the brigade. The commander of the 3rd Battalion, major Nikolaevich went missing without a trace this spring, presumably never to be found. In conclusion the Republican Guard is shaping up to become a collection of increasingly standardized military units. The appearance of the guard (Patriot excluded) serves as a morale boost to troops as well as a tool for nation building. With increased normalization, and a switch to a brigade structure (primarily), should come an increased capacity to act as a capable homogenous fighting force granted the Republican Guard can solve its personnel problems which it is currently facing for heavy equipment. As a final remark, the “DPR” does have a single Antonov AN-2 biplane operational which keeps “DPR” hopes high that the republican guard can eventually transform into a real VDV force, this however is highly implausible as chances for survivability are low and Republican Guard units have not undergone jump training, even though there is the possibility that individuals within the RG have. The structural situation of the republican guard, and indeed the entire “DPR” armed forces, still appears to be fluid, and is likely to change over time. Summary: Military reform is underway in the de-facto state of Donetsk People’s Republic (“DPR”). All armed military units are being consolidated under a single command structure of the 1st Army Corps of the Ministry of Defense of the “DPR”. This should mean improved combat effectiveness due to a greater unity of command. The Donetsk People’s Republic (“DPR”) armed forces today are much different from what they were even a year ago. Stemming out of rebellion, the current iteration of “DPR” armed forces greatly resemble a modern military. What today is a fairly well organized army used to be a wide array of militia groups local to the three main cities of Slovyansk, Donetsk, and some even from Lugansk. The armed forces of “DPR” are centralized under the Ministry of Defense (MoD). Commanded by Major-General Vladimir Kononov. The “DPR” MoD is centered around a single 1st Army Corps, which in turn consists of a variety of elements which you would come to expect from a modern ground force – from signals to armored battalions. This 1st Army Corps celebrated its one-year anniversary  on the 12th of November with a parade which showcased a professional and streamlined looking military. It is important to remember that troops on the front lines rarely look so uniform as they do on parades. Often militiamen rely on donated uniforms or will buy their own. Such parades are mainly for show, tanks get a fresh layer of paint and the soldiers present wear clean uniforms. They shouldn’t be taken as indicators of the current state of the “DPR” MoD, but rather as visions for what it might look like down the road. The Ministry of Defence holds two main combat elements under the 1st Army Corps – these two elements consist of a cluster of several “Separate” units and the Republican Guard (RG). In its current state, the Separate units of the 1st Army Corps hold the task of offensive action whereas the Republican Guard is tasked with defence of its assigned territories but also has elements of rapid reaction forces and special forces/reconnaissance. The Republican Guard is slightly smaller than the Army Corps, but is still sizable especially when compared to the armies of other de-facto states. In times of relative peace, like now, reconnaissance companies within battalions and brigades are some of the more active units in the zone of conflict. Separate SF units such as “Somali” on the other hand have fallen into relative obscurity as it has become evident that their actual activities have very little to do with recon or SF. Instead, they seem to be regular mechanized forces which serve as types of rapid reaction forces which can quickly go where needed on the front lines. There is some uncertainty around the specifics of the structure below , no official structure has been released, so all information is through non-official releases which merely hint towards a certain structure. Notable is the specific situation regarding the Military Intelligence Directorate (GRU is a more commonly known abbreviation). Pre-reform GRU was under the Republican Guards command structure, however the current situation of the GRU is largely up for speculation. One possibility is that the GRU exists as is pictured in the diagram above, another is that it has been dissolved and integrated with the current “Republican Guard” as reconnaissance battalions, as some evidence would support. A third possibility is that there is no real GRU and that the units which had comprised it float around in the Army Corps under no consolidated directorate. Very few units in “DPR” are not under the MoD structure, however such individual units do exist. One example of this is the battalion “Legion” which was long thought to be under the Republican Guard. In actuality this battalion is part of the Ministry of Emergency Situations and supposedly acts as a reconnaissance battalion. It is worth noting that the entire “Legion” battalion is sworn in with the majority political party in “DPR” – “Donetskaya Respublika”. This raises further questions about the tasks of “Legion” which shall not be answered in this article. It is however very likely that the battalion is a tool for defending political power in the young republic. There is evidence that the “DPR” & “LPR” armed forces have been doing a lot of resource sharing as though they were under a unified command. It is evident that after “DPR” received its shipment of T-72s, it no longer found a use for its Ukrainian captured T-64’s and transferred them to the “LPR” National Militia. This is evidenced by the fact that “DPR” armor consists of around 75% T-72s, whereas in the “LPR” it is the other way around – the vast majority of “LPR” tanks are T-64BVs. The Ukrainian intelligence graphic would suggest that the entire 7th Mechanized Brigade has been transferred under “LPR” command, some information which would support this theory. During the recent pullbacks of heavy armor, the 7th brigade pulled back and stored its tanks in an “LPR” base along with other “LPR” tanks. During the pullback of 7th brigade armor, “DPR” 1st Army Corps social media cited it as still belonging to the “DPR”, but being in zone of control of the “LPR” “2nd Army Corps”. These social media accounts are often operated by private volunteers, so there is a possibility that this post is simply a reflection of personal opinion rather than fact. In light of this gray zone, the 7th Brigade isn’t included in the “DPR” table of organization. The graphic above is offered as an alternative to Ukrainian intelligence releases of visualizations of the “DPR” MoD and the Lugansk People’s Republic (“LPR”) “National Militia” (NM). The main problem with them is that they fall within a political discourse that is not doing the Ukrainians any favors. In the Ukrainian graphics the “DPR” and “LPR” militia are viewed as a single Russian occupant army. Although both these military/militia organizations depend greatly on Russian support, there is no point in branding them as Russian occupiers, it distracts the observer from the wider issue of local unpopularity they face. However, an interesting aspect of the Ukrainian graphic is that they choose to view the “DPR” Armed Forces as the 1st Army Corps and the “LPR” as the 2nd. This is to suggest a sort of unified command between the two “occupant armies” which would further legitimize the discourse of Russian involvement. It is an interesting notion which might have some truth to it, at least in some capacity. One “DPR” source had in the past listed the “LPR” National Militia as the 2nd Army Corps, unfortunately no web cache exists of this, only a single post mentioning the “LPR” NM as the 2nd Army Corps. Otherwise it is not possible to find any indication that the “LPR” is embracing this. In all press releases and other forms of open source material released on the “LPR” armed forces by forces loyal to Lugansk, the term “National/People’s Militia” has been used. If we were to entertain the notion of a dual-corps structure in which they both operate under a single command, a paradigm-shift might be in order. If we accept the paradigm that two armies, ostensibly subject to separate ministries of defence and state leaders act as though they are part of one greater command structure which transcends their individual states, then this must mean that there is something which is higher up the command chain than the “LPR” or “DPR” holds. The only plausible entity that could fill this position would be the Russian Federation. I am, however, perfectly ready to discard this theory in spite of its popularity. This is not because I believe that this scenario is implausible, but more because I consider there to be a lack of supporting evidence. As the saying goes, extraordinary claims require extraordinary evidence. I find the notion that the “DPR” & “LPR” act as a loose coalition with individual areas of responsibility. This is not to say that the survival of the “DPR” and “LPR” don’t depend on Russian support, but that I believe that their command structures are not connected to those of the Armed Forces of the Russian Federation. The possibility of something more vague is far more likely, a scenario in which Russia wields great influence over these armed forces and to some extent also commits some of its own forces. “DPR” armed forces have undergone significant restructuring to reach their current structure, which is not yet in its planned final state. Some artifacts of the old system still remains, most notable are “Somali” and “Sparta”, best known for their roles at Donetsk airport, which still function as separate battalions under the “DPR” Ministry of Defence. Other less notable units still remain as “Separate” units both throughout the Army Corps and the Republican Guard. This phenomenon is far more prevalent in the Army Corps as all units were made to submit to its control upon its creation. The Republican Guard was only created later and units were taken from the Army Corps and re-organized under RG command. The term “Separate” should not be misinterpreted as separate from Army Corps command. Separate units still operate within an organized command structure and exist in most modern militaries. The Republican Guard, upon its creation, began as a separate entity under the authority of the “ head of the republic”, Alexander Zakharchenko. Eventually the Republican Guard will be completely absorbed into the 1st Army Corps, however it is not entirely clear how far along in the process they are with this re-organization. Material evidence shows that the Republican Guard has been absorbed into the Army Corps, but still gets to keep its name, function and legacy can be found in the flag ceremony of the Republican Guard’s “100th Brigade”. In the ceremony, the flag was presented, revealing it to be the same type and format as units in the MoDs 1st Army Corps. The flag does however still have “Republican Guard” written on it, even in a post-reform environment. The aim in re-organizing the Republican Guard is to bring the all of the “DPR” armed forces under a unified command in an effort to reach the highest possible level of combat readiness should fighting resume. Supposedly, the decision was made in light of the Republican Guards failures at Shyrokino, which the leadership linked to a failure to draw proper support from the Army Corps. Shyrokino fell to Ukrainian forces – namely the “Azov” battalion during the last days of the pro-Russian push for Debaltseve, since then the town remained contested until July 2015, at which point “DPR” forces pulled out of the town. This structure in specific is very standard, similar structures will be noticed in the militaries of other separatist de-facto states like South Ossetia and Abkhazia. This information graphic is produced from open source information and deduction. Often militants and their vehicles in the “DPR” have insignia denoting which unit they belong to, which is easily found via pro-Russian sources. Compiling this data gives a greater perspective of the overall structure of the “DPR” MoD, but gives little insight into its actual size. The main factor which helps us gauge the actual size of individual units is vehicle numbers. For example, the “separate” Tank Battalion “Diesel” is known to be approximately of the size of a regular Russian tank battalion, having around 40 tanks in its inventory. One caveat of relying on open source information is that it is difficult to conclude that a unit doesn’t have a certain amount of manpower just because you can’t see them. Without well documented official figures there is really no way of knowing whether or not “rank inflation” is taking place in the “DPR” MoD. As far as Russian backed de-facto states are concerned (Think Abkhazia, Transnistria etc. ), the strength of the “DPR” armed forces is rather unprecedented, both in terms of manpower and equipment. For reference, Separate Tank Battalion “Diesel” alone is equivalent to the Russian tank battalion involved in the 5-day war against Georgia in ‘08. Diesel holds an estimate of 40 Tanks, the bulk of which are of the type T-72B, but also has Strela-10 and mechanized elements within its ranks. One interesting detail about the armed forces of the “DPR” is that unlike so many other pro-Russian de-facto states, they don’t officially operate any aerial or maritime vehicles. One reason for this might be that rebels haven’t “inherited” any operational aerial or maritime vehicles from Ukrainian forces. Furthermore, the fact that the conflict is still very much ongoing means that any military aircraft nearing the front lines would be shot out of the sky nearly instantly. The usability of such aircraft and maritime vehicles might be too low to justify high maintenance costs. This being said, it is entirely possible that the “DPR” armed forces suffer the same problems of a pre-reform Russian army. 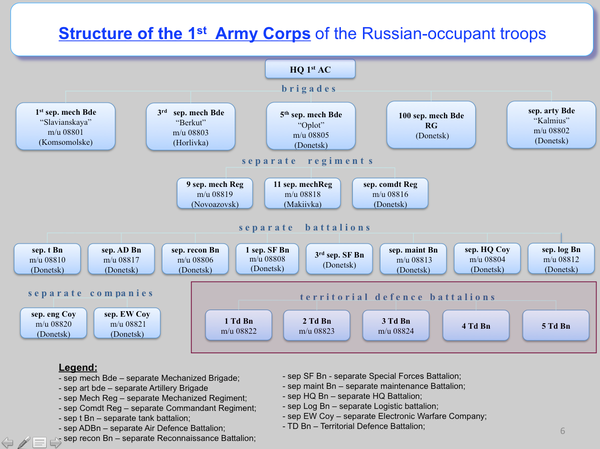 Before its reform in 2008, the Russian ground forces had an inflated organization of its units, with some Brigades holding only a handful of men. Symptoms of this phenomenon are showing in the “DPR”, especially within the Republican Guard in which only the 3rd, 5th and 6th Battalions are regularly noticed in social and televised media. Sightings of other battalions are uncommon and in them they are often few in numbers. However, with no official figures to go by, and a very out of date official website, it is impossible to really test this hypothesis. Giving an accurate assessment of the state of combat support in the “DPR” is difficult. Two main factors serve as obstacles to a good overview. The first is that non-combat roles are not glorified or as exciting in the same way as combat roles. You would be hard pressed to see news stories on the workings of the logistics battalion for example, in part because it’s simply not that interesting to the ordinary person. The second factor is Operations Security (OPSEC). in the past, command vehicles and artillery radars not native to Ukraine have turned up in rebel-held territory. It is my hypothesis that this equipment is generously supplied by Russia and that this is part of the reason that we don’t see much from “DPR” signals units. As such, pro-Russians exercise heavy censorship of some of the indisputably Russian materiel, while publicly displaying that which has or could have been captured from Ukraine, creating an illusion of independence. The “LPR” serves as a contrast on this point, where the logistics battalion, combat engineer units and signals battalion is publically displayed through local media. In the early days of fighting, anti-aircraft units were highly active in rebel territory and Ukraine suffered heavy air losses as a result. Today Surface to Air Missiles (SAM) are much less used but are still active within Donetsk. Every so often, reports surface of SAMs being launched at night from inside Donetsk city, but no follow-up is given as to what the target was, or which system was used. The most prevalent SAM system within the “DPR” is the Strela-10, however the more advanced Russian system Pantsir-S1 has also been spotted within “DPR” & “LPR” territory. It is more likely that the Pantsir-S1 is used in these night interceptions due to it having a far more advanced radar target acquisition and tracking system, compared to that of the Strela-10. The “DPR” does seem capable of repairing and maintaining their armored vehicles. This often leads to some peculiar looking T-64s, which end up getting their Explosive Reactive Armor (ERA) retrofitted in T-72B configurations. Other retrofits which are commonly made are upgrades to the armor of some BMP-2 Infantry Fighting Vehicles (IFVs), which add increased protection against small arms fire in places otherwise vulnerable. Large bore weaponry constitutes the backbone of “DPR” offensive actions, virtually every brigade and regiment has at least one tank company and every battle for strategic positions leave the ground peppered with artillery craters. In every larger push, tanks are employed to support advancing troops. An entire artillery brigade by the name “Kalimus” has been created for the main purpose of heavy artillery, although its official name suggests it to be a “special purposes” brigade. What is more, small bore artillery pieces and mortar units are embedded within most brigades and regiments. The “DPR” reliance on tank and artillery support was particularly evident in the battle for Marinka in June this year. In this case, fighters from “International Brigade Pyatnashka” of the Republican guard advanced onto Ukrainian positions but were quickly forced to retreat under overwhelming small arms, artillery and attack helicopter fire. Tanks were sourced from Independent Battalion “Somali”, Tank Battalion “Diesel” and the 7th separate mechanized brigade, from at least as far as Makeevka, which isn’t technically that far but in this context it’s significant. This significance is in part due to the small size of the de facto state, but also due to the strategically important position it was guarding earlier, in the very north. Once “Pyatnashka” had fallen back, tanks from the 1st Army Corps held the line and skirted up on the Northern flank of Marinka and shelled Ukrainian behind Ukrainian lines in an attempt to contain the counter-attack. As far as larger scale maneuvers go, the armed forces of “DPR” have a habit of going for pincer attacks and if possible, completely surround strategically important towns and positions. Strategically important positions are usually large population centers and transportation hubs, like Debaltseve, Ilovaisk, Donetsk, Gorlovka, and to a lesser extent Novoazovsk. We saw evidence of this tactic clearly in the battle for Debaltseve in which the city became surrounded entirely before the Ukrainian army decided to break through in retreat. Earlier on in the conflict, right after the tides started turning in 2014 we saw the same kind of behavior in what later came to be known as the Ilovaisk kettle. 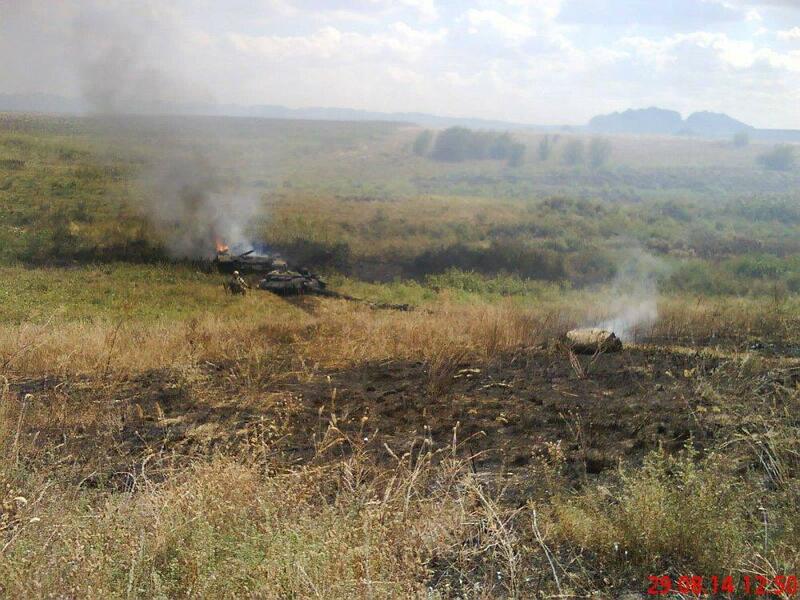 Two other attempts to surround Ukrainian positions were made simultaneous to the Ilovaisk kettle. The first was just south of Donetsk, the aim was to secure the main transport hub between Donetsk city and Mariupol. At one point it looked like the rebels had been successful in shutting down the main road which led north from Mariupol but the very next day it proved to be open. The same type of maneuver was planned if not attempted at Mariupol, rebel sources reported at one point that they nearly had Mariupol completely surrounded and that the city would be put under siege. This proved to be not even remotely true, but it did showcase a evidence of a broader “DPR” strategy of securing central infrastructure positions. Pictured above is a pro-rebel illustration of armed activities from August 23rd – 28th. 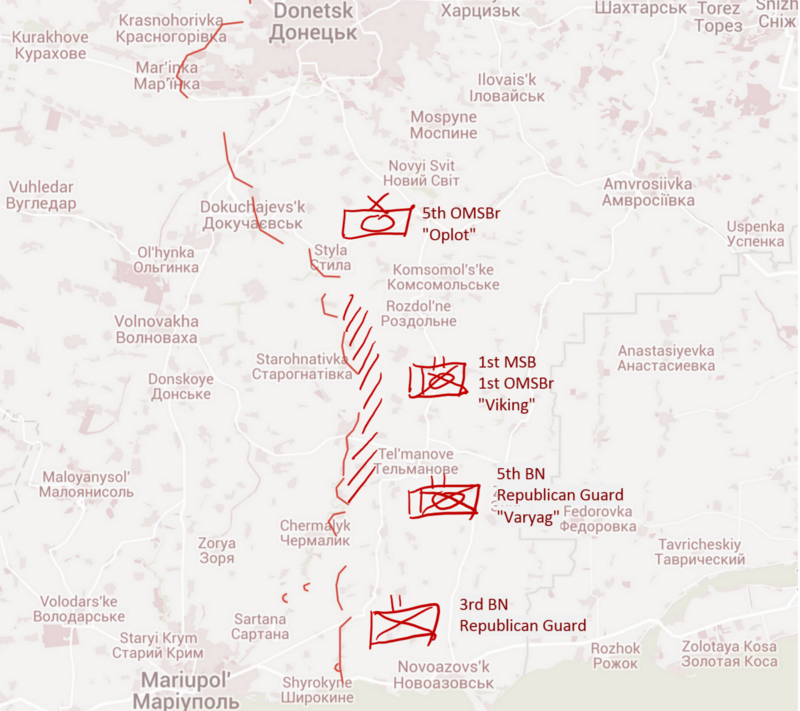 This map clearly illustrates the Ilovaisk and Mariupol events described earlier. Only the kettle at Ilovaisk was successful, and the surrounding of Mariupol was greatly exaggerated. It would appear as though the “DPR” rebels and their supporters had over-extended themselves in a rush to surround Mariupol and ended up losing some of the ground they had gained along the southern front. For comparison to the current front lines, click here. Units of the “DPR” Army Corps routinely undergo training exercises. Ranging from infantry exercises to anti-air live fire training. Recently, a tank-biathlon took place at the Torez training range, deep in the “DPR” heartland and close to the MH17 crash site. Prior to the “biathlon”, every tank unit of the “DPR” & “LPR” underwent additional training in order to be competitive. Tank battalion “Diesel” has proven to conduct training on advanced armored tactical maneuvers prior to the tank biathlon. Even the Donetsk Higher Military Command School took part in the competition which would lead to the conclusion that the “DPR” is going for a long term approach to defence by educating its future tankers locally. It is evident that the “DPR” leadership is attempting to boost their military capabilities to the highest extent possible with the resources they have. We see this both in the official line but also in the information presented in the open source. It is evident that the “DPR” wishes to invest in itself as a long-term de-facto state much like Abkhazia, South-Ossetia and Transnistria. Therefore, it is only natural that the “DPR” would want to standardize its military institutions early on in the state building process. This could be in anticipation to either an offensive action or in anticipation of one from the Ukrainian army. What we do know is that the “DPR” MoD has a single army corps which consists mainly of separate brigades and battalions. All these units are under the central command of the 1st Army Corps much in the style of armies of the Russian Federation, which doesn’t have the same habit of western militaries of collecting units into divisions under their corps structures. The “DPR” is showing a commitment to collective security between itself and the “LPR” by the tank transfers and the possible brigade transfer. This could also be considered as a sign of the two de-facto states being under a higher level of command – namely Russian. However such a conclusion would be purely speculative. Another plausible scenario is that the confederation of Novorossiya is starting to take shape as a real institution. This not a conclusion which can be drawn off this overview of the “DPR” MoD alone. In the future, a broader look which includes non-military institutions between the two separatist entities will be fruitful. Discerning the extent of cooperation between the “LPR” and “DPR” will shed more light on whether we are witnessing the emergence of a institutional “Novorossiya”, a military alliance or something entirely different. This is written mainly as a round-up of recent events, on a topic I believe has been under-explored in English-language media. In the past week, Lugansk, the capital of the separatist de-facto state of the Lugansk People’s Republic (LPR) has been subject to an unusual degree of turmoil. The source of the turmoil is a broader investigation into high-level corruption headed by the LPR Ministry of State Security (MGB) and the Ministry of Internal Affairs (MVD). The latter contains the police force. The debacle kicked off on October 17th, when the Minister of Coal, Fuel and Energy Dmitry Lyamina was detained on corruption charges. Lyamina was detained and beaten in his residence and word of his arrest was followed by the arrest of Alexander Emelianenko, a Deputy of the “People’s Council”. The People’s Council is the supreme legislative body in the LPR. The supposed charges are on the question of misappropriation of humanitarian assistance funds, a serious issue which has plagued the DPR & LPR since their inception. Igor Plotnitsky, the head of the republic, would seem to be at the center of this debacle. Following the news of the Energy Minister’s arrest he deposed Leonid Pasechnik of his position as Minister of State Security on grounds of abuse of power, the statement was later dismissed as the work of Ukrainian hackers. Subsequently Lyamina was transitioned into just being in house arrest. This sparked resistance from local mayors and other organizations, including leaders of certain armed groups, who joined in solidarity with the “state security powers” – the MVD & MGB. On October the 18th, Deputies of the People’s Council held an emergency night session supporting the MGB decision to detain Lyamina, the video of this event was made public by the MGB. The following day, Plotnitsky had a meeting with these deputies in which he convinced them that their decision was made in the heat of the moment. The “official” LPR government information portal lug-info.com, headed by Plotnitsky became subject to DDOS attacks that lasted for approximately three days and made the webpage inaccessible. As a result of this, websites of the MVD and People’s Council became the main sources of information on this specific matter. The general discourse across the board was that they lamented the illegal interference of state leadership into the responsibilities and activities of the security powers. On October 21st, reports surfaced of supermarkets such as but not limited to “epicenter” being cordoned off by armed police. These supermarkets are rumored to be owned by Plotnitsky’s wife. The buildings were formerly under the possession of the chain “ATB”. ATB Buildings were also seized in Donetsk and are used for their “First Republican Supermarkets”. On this same day, after days of radio silence, Plotnitsky was rumored to have fled to Moscow. These rumors were later confirmed but the abrupt decision to travel to the Russian Capital was dismissed as a business trip, an interesting endeavour for the head of a republic in the midst internal turmoil. A more realistic hypothesis is that Plotnitsky went to the Kremlin, troubled with his rogue security apparatus. The Russian leadership decided that Plotnitsky must stay in power at least until the next round of elections, in fear of the consequences of a power vacuum. Beyond this, allowing the Ukrainian and Western media to capitalize on the political instability would be adverse. This is of course purely speculation, but not completely unfounded. Now, on October 23rd, it would appear that an accord of sorts has been struck as was briefly discussed at the plenary session of the LPR People’s Council. The agreement was that the security apparatus would increase cooperation with the head of the republic. Furthermore, the political party “Lugansk World” (also the majority party) will henceforth serve as a public inspector in the anti-corruption realm. Everything considered, this whole affair would all appear to be a coup averted by the will of Russian leadership. What is not known is the intention of the security apparatus in moving in a direction of deposing the Head of the Republic. Whether this was ever really a coup in process is up for discussion, however the amount of pressure put against the head of the republic by the security apparatus and the way Plotnitsky became marginalized suggest at best a very serious power struggle. Regardless, whether or not we have witnessed an averted coup or just a power struggle, it is clear that there has been some sort of compromise, whether this involves more power to the security apparatus remains unknown. A lot of the information put forward here (or rather, the manner in which it is put forth) is dismissed by pro-separatists as propaganda, so take it with a grain of salt if you wish. If not for my distaste towards cheesy made up words, I would call this a coupromise. No, Mariupol is not in danger. Mariupol is not in danger, it never truly was and it probably won’t be for a long time. Time and time again Ukrainian leadership has exhibited an extraordinary focus on the strategic coastal city intimes where it has not been warranted. Granted, Mariupol holds great importance both strategically but also to the peoples of Ukraine and Donbass, and make no mistake, a loss of the city would be catastrophic. During the battle for Debaltsevo, another strategically significant city, connecting many of the regions railway lines, the Ukrainian leadership seemed more worried about the defense of Mariupol even though Debaltsevo was increasingly proving to be a losing battle which required urgent attention much earlier on. Still, most attention is being lent to the southern front, with the media spotlight being the suburb of Shyrokyno, which has been subject to a change of hands a couple of times throughout the course of this year. Recently Shyrokyno has fallen into Ukrainian hands, but is still subject to relatively frequent small arms attacks from the other side, with predominantly the Republican Guard 3rd battalion present in that region, but evidence of the 1st Slavyansk Battalion AKA 7th Independent Motor Rifle Battalion of the 1st Army Corps of the DNR MoD has surfaced recently. The 1st Slavyansk is otherwise regularly stationed in the area around Debaltsevo so its presence in the area is somewhat unusual. Just north of Shyrokyno a couple of peculiar things are happening, first and foremost, the 5th Battalion of the Republican Guard “Varyag” is transitioning into a “Special Forces” battalion as part of the Army Corps. This move has come shortly after the DNR announced a pullback of heavy weaponry and that sources from the 1st Independent Motor Rifle Battalion “Viking” reported concern over the scale of the pullback of arms, lamenting that even their BMP support had been pulled back from the front lines. Whether any of this information has any factuality to it remains to be seen, but given the nature of the information and the channels through which the information has been released I see no real reason to question it. All this could point to further restructuring of armed forces within the DNR, perhaps reflecting a slow transition of Republican Guard forces to internal security with tasks such as continuing previous tasks such as guarding railroads, leaving front line activities under a unified Army Corps command, although such a move might make too much sense for this conflict. However, incessant changing of structure since late last year makes up for what would seem like common sense in what would seem to be an array of haphazard reorganizations. Pictured above is a rough presentation of the pro-Russian composition of forces on the southern front. Whether or not the level of pull-back matches that of “viking” Battalion all along the southern front remains to be seen and is highly improbable, but what we can deduce from all this information is that the DNR is putting a greater focus on defense on the front between Mariupol and Dokuchaevsk. It is not unreasonable to speculate that this extraordinary pullback in the south could be with a couple of reasons in mind. First and foremost Mariupol is home to one of the most prolific volunteer groups in the conflict “Azov” and the defense of the city has long been left up to such National Guard volunteer groups. Such groups have long been known to take their own initiative, in spite of Kiev government directions. As such, a pullback could have been carried out in hopes of luring out opportunist volunteer groups and possibly take advantage of such an offensive to justify their own further north, something which Azov Division themselves had done during the Debaltsevo pocket in which they significantly pushed back DNR forces back to Shyrokyno. This would allow them to extend their border with Russia which would greatly benefit the Luhansk People’s Republic as they would gain a significant rail city of Stanytsia Luganska as well as more border region with Russia if such an offensive would be successful. However, these groups have recently been replaced by Ukrainian Marines so such a scenario is relatively unlikely. Another large factor contributing to the significant pullback of large-bore equipment in the south is that the lines have solidified around natural borders much like they have in the north, wide and windy rivers combined with large open plains make advancing on the enemy highly problematic and sure to result in heavy losses. Simply put, for the DNR it’s just not worth it. None the less, the north is in far greater risk of a serious offensive than the south at this point. Areas around Stanytsia Luganska have been subject to frequent reconnaissance patrols and the LNR National Militia appears to have solidified into something resembling the DNR Army Corps far better than the DNR. Furthermore, the vast majority of “trophy” T-64BVs captured by pro-Russian forces in Donbass have been transferred to tank battalions in the LNR National Militia while the DNR keeps their Russian donated T-72 workhorses. Columns of T-72Bs reminiscent of the infamous footage of the outbreak of the 08/08 war are increasingly common sights coming out of ceasefire Novorossiya, and with good reason, these steel beasts have come to form the backbone of the separatist defense. The T-72 chassis is no stranger to the Ukrainian armed forces, Just this winter a large shipment of T-72As came in to aid in the fight against Russian backed forces but have been nowhere to see in the vicinity of the front. Furthermore, Ukraine has been known to produce T-72B1s and other variants of the chassis for export. The DPR & LPR however seem to have found a far more functional use for these tanks and as the war has dragged on more and more captured T-64BVs seem to have been swapped out for the Russian workhorse that is the T-72. Although in the DPR most units (save for Republican Guard battalions) field the T-72, the highest concentration is to be found in the DPR Ministry of defense 1st Army Corps’ Independent Tank Battalion known as “Diesel”. “Diesel” is known to field at least 35 T-72 tanks, each of which has been individually verified through open source information using their battalion specific markings. Although “Diesel” also has several of the more advanced T-72B3 variant and a handful of captured T-64BVs, the vast majority of armor in the battalion is made up of what has come to be known as the T-72B1, in numbers unprecedented on the Ukrainian side. The exact assignment and geographical position of “Diesel” is rather vague but it can be deduced that it has been assigned with assisting in offensive action in the northern regions of the DPR, This deduction is largely reached by movement recorded in the area of Makeevka towards Donetsk and subsequent footage of “Diesel” troops aiding “International Brigade Pyatnashka” in their fight for Mar’inka alongside “Somali” and and armor from the 7th “Slavyansk” motor rifle brigade of the DPR Ministry of Defense 1st Army Corps. What is interesting about “Diesel” in particular is its status of somewhat of a new kid on the block as it hasn’t yet any reputation from previous battles unlike many of the older units such as “Oplot”, “Somali” and “Motorola”. In fact, it would appear that “Diesel” has sprung out of nowhere. Much speculation has been made that “Diesel” has been created out of “Oplot” — an old armored fighting unit active since the Ilovaisk era but no credible evidence has been put forth and this shall remain speculation. Much more likely is that this is a unit reserved mainly for Russian tankers supplied with the Russian tanks they are used to, mixed in with a couple of locals to look good for the camera. To justify the speculation that the purpose of Diesel is offensive action (beyond what was witnessed at Mar’inka) I will refer to footage of “Diesel” undertaking amphibious exercises with a mechanized bmp-2 element of theirs. With water bodies being a large obstacle to the expansion of DPR territory, it would make sense for units intended for offensive purposes to undergo training to overcome such obstacles. Beyond that, because of the ceasefire, armor is only ever used when the DPR truly wants to put pressure on Ukrainian defenses, which speaks loads about the nature of “Diesel”, which only began to let itself be known after the cease fire. Another peculiarity about this unit in particular is that some armor in “Diesel” features different Russian railway markings than regularly found on DPR/LPR tanks in Ukraine. Regularly, Russian tanks in Ukraine will be marked with a destinctive “н2200” on the side after a circle with a cross through it, however some “Diesel” armor is marked with н1200 (or и1200, low quality footage makes it difficult to tell), this is specifically in reference to T-72B1s with the 11xx individual unit markings and a T-72AV. What this tells us, I don’t know, but it is certainly a peculiarity to take note of. There is no way to know what role “Diesel” will play in the future as we do not know what the future holds for Ukraine in general. It is however safe to assume that we will be seeing plenty plenty from them should hostilities flare anew, beyond back-and-forth shelling and back into offensives in the North/Eastern direction. The State of Ukraine project is back up and running and has been completely redone. The map is likely subject to some errors especially with regards to specific defensive positions in low intensity areas. The map updates sporadically. The most notable changes from the last iteration is the amount of territory gained by the NAF in Lugansk, the closing of the Deba’ltseve pocket and the fall of the Donetsk airport. Marin’ka has been changed to contested and a lot of clutter of information which is no longer relevant has been removed. Today, (or yesterday depending on where you are) on September 2nd, some incredibly significant footage of a significant amount of Russian Federation regular troops supposedly venturing beyond the sovereign borders of Ukraine. The video depicts an entire mechanized battalion positioned between Luhansk city and Krasnodon and speaks to the scale of the Russian incursions into Ukraine. Click here to view the video. Continuing on the topic which seems to be the only thing I ever write about anymore: Russian materiel and the implications of it being in East Ukraine. This post will be less focused on pointing out why and how different vehicles come from the Russian Federation as this has already been established plenty. If you still don’t believe that Russia has been supplying military hardware and been directly involved in the conflict then odds are you never will. In light of the recent counter offensive launched by Novorussia and her friends, which turned a routing rebel force into a mighty army practically bulldozing over Ukrainian positions, it has become apparent that Russia doesn’t want to expose it’s presence to the world more than necessary. This is why the recent images coming out of Ilovaisk now are so interesting, because they show the plethora of Russian armor attacking the Ukrainian enclaves within Novorossian territory. Although militarily the Ilovaisk pocket incident was a crushing victory for the Novorossian forces, the footage that came out of it revealed at least three T-72B3s either captured, knocked out and even at least one completely destroyed. This behavior would point to a certain level of caution, or as Kremlin would probably consider it: “restraint” by Russian regulars in eastern Ukraine. it’s in the interest of the Russian federation to keep their name out of the conflict as much as possible while still securing a decisive victory, as such, militants of the DNR and LNR are paraded in front of the cameras while regular forces mop up the pockets of resistance and stay in the rear during major pushes for territory. During the next couple of days we should expect to see a far more blatant Russian involvement in eastern Ukraine than previously seen. Even considering the US satellite imagery, this recent video is the single largest recorded incursion by Russian Federation troops into Ukrainian territory since Crimea. Tonight has already witnessed one attempt at Mariopol’ and the future of this conflict may very well depend on how well the Ukrainian army can defend it. As far as civil wars and insurgencies go, the conflict in Ukraine has been incredibly heavy on maneuver warfare since the stunning counteroffensive. Considering this, the Ukrainians have to be extremely careful not to end up having Mariopol’ surrounded. Knowing the might and skill of Russian armor from the last august war in Georgia it should be interesting to see how it will play out when Russia ‘only kind of wants it’. Taking into account the recent success at Luhansk airport in which Ukrainian forces were also deeply entrenched, we should expect to see some very heavy fighting in Mariopol’, and the city may very well be as leveled as the airport by the time Russian armor rolls through. 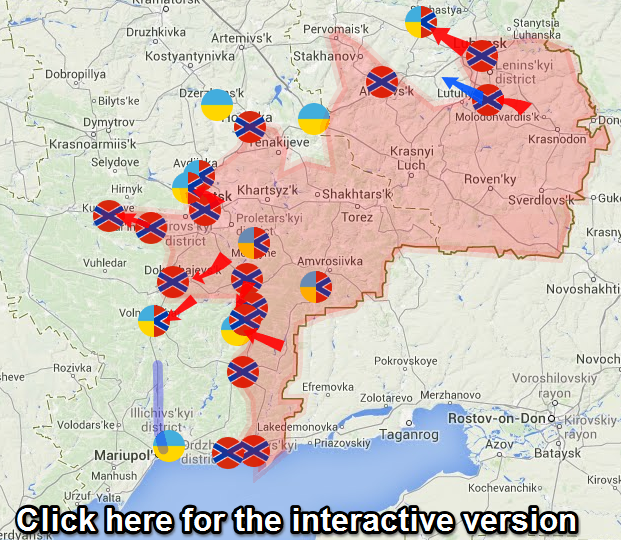 All further updates to this map can be found in the ‘State of Ukraine’ tab. Because WordPress for whichever reason won’t embed Google maps, I have to link directly to a standalone site. The main polygon has a weird grid that comes with map engine, if it’s too bothersome I’ve uploaded the raw .kmz for your viewing pleasure. The map is largely incomplete in the name of of keeping it easy on the eye. Please report any inaccuracies in the comments, I’ll be updating the map as the conflict progresses. The recent significant surge in tanks exotic to eastern Ukraine and the substantial gain of territory in of DNR forces has lead many to conclude that direct Russian involvement is taking place to the extent that it could be considered an invasion of Ukraine by the Russian Federation. Beyond the obvious evidence of Russian troops captured on Ukrainian soil supporting these claims, many (myself included) have been pointing to the out of place armored vehicles appearing only on the rebel side. 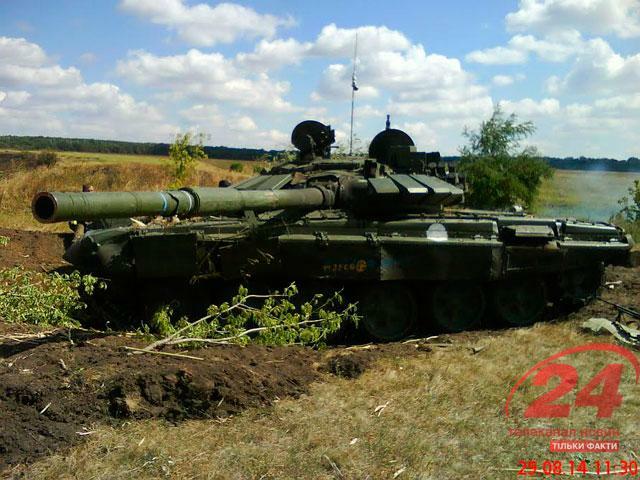 Many T-72Bs like these, both with Kontakt-5 and Kontakt-1 Explosive Reactive Armor (ERA) have been posted across the web as hard evidence of an ongoing Russian invasion of Ukrainian sovereign territory. However likely it may be that these tanks do represent a mobilization of Russian forces on Ukrainian soil, there is a plethora of arguments seeking to discredit that notion. Some of the most controversial footage to surface yesterday – August 27th, was of an allegedly Russian T-72B3 or possibly BA1 (AKA T-72B + Kontakt-5) that had been overrun and captured by Ukrainian forces in Donetsk. The tank, having sustained light battle damage considering that it was devoid of any crew was also marked by white stripes on each side. These stripes are usually used for Ukrainian troops to identify each other in the heat of battle which is why many were shocked to see them on a tank not before seen fielded by the Ukrainians in this theater, or at all for that matter. Some say that this is proof that Ukrainians have been operating T-72B3s all along while other say that it was marked by Ukrainian soldiers after having captured it. 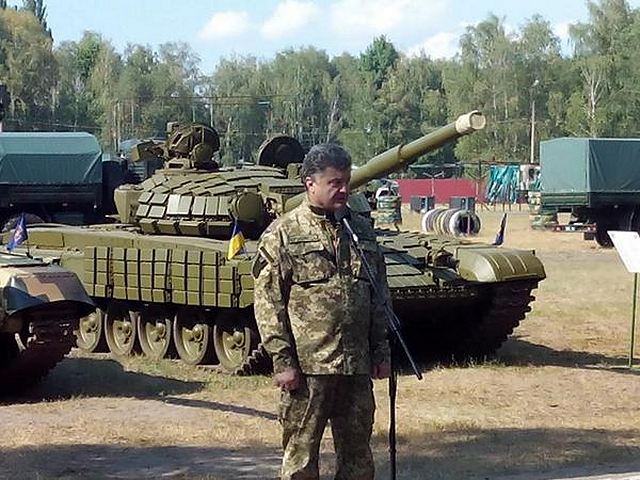 Skeptics of the claims of invasion have been quick to point to images like the one below of Petro Poroshenko standing in front of a T-72B1 (+ Kontakt 1 ERA) as well as footage from the Kiev 7th Armor plant of T-72B1s in working configuration to dispute the possibility that the tanks could be Russian. What has yet to be explained however, is that no T-72B1s or T-64Bvs in Ukraine on the Ukrainian side have been seen with the commander’s hatch shield that so often are seen on rebel tanks. 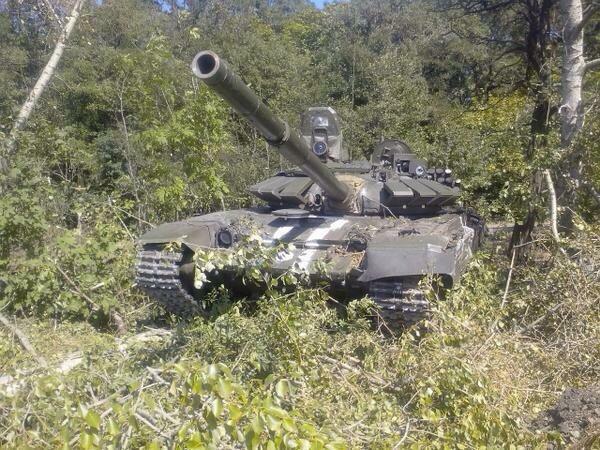 Another trend worth noting is that no Ukrainian tanks have been spotted with Kontakt-5 ERA up to this point. All modern Ukrainian tanks are fitted with the domestic Nozh ERA. Nozh ERA may appear similar to Kontakt-5, but upon closer inspection the differences are clearly visible. Furthermore, Nozh is hidden behind metal plates on Ukrainian tanks such as the T-84 or BM-Bulat. This specific ERA is featured in the video from the Kiev factory which may have caused some people to confuse it with Kontakt-5 on a T-72B3 (and on some B1s), but if you look closely you’ll see that it’s more likely to be a T-72AG in the making.